Gauging a towns' risk of crime is a complex process, which result is best reviewed in that town's relative position to the national crime rate as based on a scientific process reviewing observed and expected (predicted) rates for the diverse socio-economic, landuse and crime parameters. The RISC MODEL investigates each town and village in Malta at NUTS 5 level (Local Councils) of which there are 68 in the Maltese Islands: 54 in Malta and 14 in Gozo. Based on data from 1998 onwards, each town is analysed for its risk of crime on an annual basis by types of crime of which there are 18 main categories: 17 thematic categories and a Grand Total category. 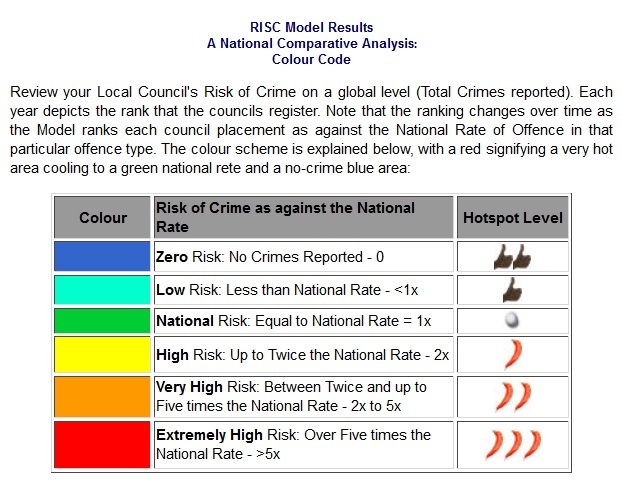 The risk of crime looks at the offences in each town and gauges its risk of offence as against the national rate. The analysis results in a league table of Maltese town's risk of crime. The table shows those Local Councils that are the safest to live in, the ones in between and those that are the worst off. In addition, the rate of change over the years are analysed and the Local Councils showing improvement and deterioration are depicted. 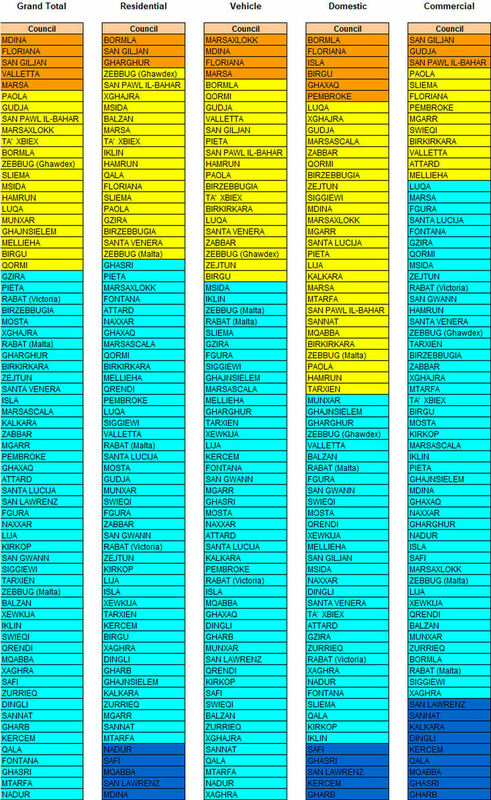 A RISC Colour Code was created to help gauge the severity in visual form. As part of a review of RISC Modelling for the Maltese Islands, a number of analytical studies have been carried out for the period between 1998 and 2018. Domestic Violence and Commercial Activity-related RISC has been included as from 2015. In terms of Grand Total Offences, Mdina pushed San Giljan to third place where it had maintained its perennial hold at the top of the League, with Mdina hosting between 2 and 5 times the national rate of offences, which is calculated as the observed offences as against those which should potentially occur in those areas under study. Also at a rate between 2 and 5 times the national rate, Floriana followed a close second, which group also comprises San Giljan, Valletta and Marsa. At a rate between the national up to twice that rate one can find Paola, Gudja, San Pawl il-Bahar, Marsaxlokk, Ta’ Xbiex, Bormla, Zebbug (Ghawdex), Sliema, Msida, Hamrun, Luqa, Munxar, Ghajnsielem, Mellieha, Birgu and Qormi. All the other Councils host a lower that national rate, albeit none have a Zero RISC. Whilst this category of offences registered no councils having over 5 times the national rate of offences, in 2018, the relative RISC still appears for Bormla, San Giljan and Gharghur, the latter registered within the 2x-5x RISC. The rate between the national up to twice that rate category includes Zebbug (Ghawdex), San Pawl il-Bahar, Xghajra, Msida, Balzan, Marsa, Ta’ Xbiex, Iklin, Hamrun, Qala, Floriana, Sliema, Paola, Gzira, Birzebbugia, Santa Venera and Zebbug (Malta). In contrast, most other zones have lower than average rates and that Nadur, Safi, Mqabba, San Lawrenz and Mdina registered zero residential offences in 2018. During 2018, Marsaxlokk took top spot, followed by Mdina, Floriana and Marsa as the highest RISC areas where one's car could be vandalised, broken into and/or stolen, which towns host between 2 and 5 times. Note that these towns host the largest parking and transport-related activities that attract offenders to high-volume and relatively less monitored opportunities. Domestic violence reports pertain to stalking, slight bodily harm, grievous bodily harm and psychological harm. Bormla, Floriana, Isla, Birgu, Ghaxaq and Pembroke host between 2 and 5 the national rate. With diminishing rates of RISC, it is imperative to note that a significant number of councils exhibit some form of domestic violence that is above the national rate (yellow in the RISC maps depicted in the CrimeMalta website) at 1-2 times the rate. In effect all towns have incident reporting but may register lower than national rates. At the other end of the scale, Safi, Ghasri, San Lawrenz, Kercem and Gharb registered zero offences, a phenomenon also found in rural and small areas were the changes in legislation may yet have an effect in terms of encouraging victims to report. San Giljan hosted the highest RISC rates, which at the top of the League, host between 2 and 5 times the national rate of offences. Gudja (also due to the MIA activity) and San Pawl il-Bahar was registered within this category, indicative of their proximity to the main economic centres such as the San Giljan recreational zone and the Gudja airport. The least RISC registering towns at zero RISC include San Lawrenz, Sannat, Kalkara, Dingli, Kercem, Qala, Mqabba, Ghasri and Gharb.